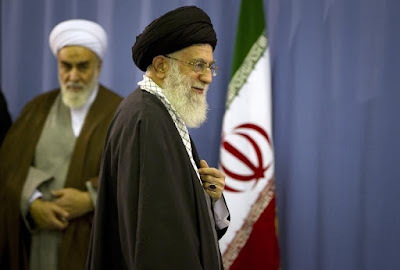 Iran’s Supreme Leader Ayatollah Ali Khamenei today warned against further negotiations with the United States. Such talks are “forbidden,” Khamenei told an audience of IRGC commanders in Tehran. Khamenei said that “careless or some simple-minded people who do not understand the facts” are the cause of Iran’s “problems.” In his coded language and in what was probably intended as a threat against his domestic opponents, Khamenei added, “And the enemy helps those people” (presumably those advocating relations with the United States). On the nuclear agreement, Khamenei said the opposing parties (the West) had made “damaging moves against Iran’s national interests” in the talks. He did not elaborate, nor did he say that his veiled criticism of Iranian negotiating team meant he was now against the deal. As Times’ Thomas Erdbrink reports from Tehran, Khamenei is widely seen as the final arbitrator of the nuclear agreement. This man has no respect for the majority view point. Arrogant beyond belief. From now on, none of the elected government officials, including Zarif and Rohani, dare to enter into any form of negotiation with US. The conservative opposition will use his word as a weapon to attack them into oblivion by impeaching them out of power if Khamanei chooses to take a neutral position in public. This man is not a force for good but a force that would bring misery for ordinary Iranians. Go away and let us be. I find it interesting how most commentators are quick to criticize and demonize Khamenei for everything that's wrong with the country. However, no one gives the man his due for the country's achievements, however mediocre they may be. It is quite clear to every Iran political observer that this nuclear deal, in fact even the negotiation for the deal, would never have happened without his blessing. He even publicly protected Rouhani/Zarif from some of the more zealous homeboys in the majles. Hardly the behaviour of a hardline extremist Islamist zealot. The man is much more pragmatic, intellectually subtle and calculating than most people give him credit for.